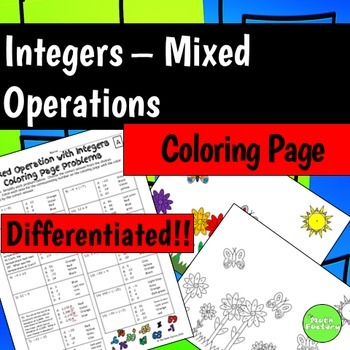 Mixed Operations with Integers Coloring Page: Integer practice made fun! 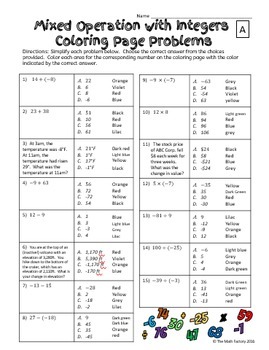 This is a 2-pack, differentiated coloring activity for middle school students to practice adding, subtracting, multiplying, and dividing integers. Both levels include negatives and word problems. Version A is easier with all problems only having two numbers to compute. Version B is slightly harder with some problems having three or more numbers to compute. Both versions result in the same picture, so you can easily differentiate, but only have one picture to check! To complete the activity, students simplify each problem and choose the correct answer from the choices to the right of the problem. Each answer choice has a corresponding color. 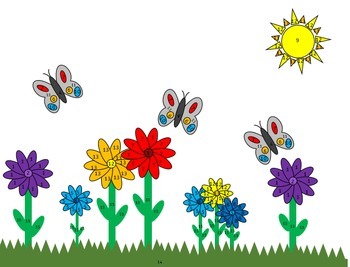 Students color each space on the coloring page with that problem number the color that corresponds to the correct answer. Please note that several problems have the same color as the correct answer. I did this, so that teachers who didn’t have all types of exotic crayons could still use this activity. So, tell your students not to be alarmed if they get blue, purple, etc. for more than one problem.